The city of Bangkok is a truly fascinating place to visit, and it's easy to understand why it's a popular destination place for those who love experiencing culture and adventure. One of the most popular visitor attractions in Bangkok are the floating markets, and fortunately there are many options. Some of the most well-known floating markets, such as the Amphawa market, are located outside the city. Others are located within the busy streets of Bangkok. Bangkok and the city's surrounding area became known as the "Venice of the East" due to all the canals and connecting waterways. Citizens of Bangkok relied on canals for transportation, and as a result, vendors began to sell goods right from their boats. This created what came to be known as the "floating markets", where vendors meet in their boats to sell their goods. Today, canals are still sometimes used for transportation in and around Bangkok, and they allow for the existence of these floating markets. Here are some of the best and most well-known floating markets in the Bangkok area. The Amphawa floating market is one of the largest in Bangkok, and certainly one of the most popular markets with tourists. Many are drawn to this market for its scenic setting, unique boutiques, and restaurants where you can sample delicacies. Visitors can purchase Thai desserts, souvenirs, and more. You can also join a boat tour to see views along the Amphawa Canal, and at night you can take a boat trip to watch fireflies among the cork trees. The Amphawa market offers a laid-back, one of a kind experience, and there's so many different things you'll find there. From delicious seafood to fashion boutiques, there's so much to see. Many of the vendors sell mostly souvenirs, but if you don't mind it then you'd enjoy this market for sure. It is located about a 1.5 to 2 hour drive away from Bangkok - 50 kilometers southeast to be exact. The Amphawa market is open on Fridays, Saturdays, and Sundays, from 8am to 9pm. If you're hoping to avoid the crowds, it's best to visit early in the day. Not far away from the Amphawa market is the Tha Kha Floating Market, which may appeal more to those who prefer smaller markets. Less tourists visit this market, but it's pleasantly quiet and has an authentic, local feel to it. It is a very relaxed market in a rural setting, and perhaps the most laidback out of all the floating markets in Bangkok. The market used to be open once every 4-5 days, according to the moon phases, so visitors needed to check that it would be open. However, it has recently become open every Friday, Saturday, and Sunday due to high demand. The Tha Kha floating market is a wonderful spot to visit if you're looking to enjoy a traditional, quiet experience. Located only 20 kilometers east of Bangkok, this small floating market offers a variety of foods just begging to be tasted. You can purchase exotic fruits, grilled meats, seafood, and more; the Tha Kha market is perfect for anyone who loves street food. Although it is definitely small compared to other floating markets, there is a wide choice of foods to choose from and it offers the chance to see a glimpse of true Thai village life. Although t's located only 20 kilometers east of Bangkok, keep in mind that it isn't as easy to get to as other markets. It's located in Phra Pradaeng, where there is minimal forms of public transportation. However, if you're willing to brave the traffic, you could simply take a taxi directly to the market. Or, you could take the ferry from Wat Bang Na Nawk and taxi from the pier to the market. The Bang Nam Phueng floating market is open Friday, Saturday and Sunday from 8am until 2pm. The Damnoen Saduak floating market may possibly be the most famous in all of Thailand, and it's easy to see why. Although it's one of the farthest from Bangkok at 100 kilometers southwest, it's worth visiting. Vendors offer fruits, vegetables, flowers, and more. You can also find delicious foods for sale along the banks of the canal, as well as souvenirs and other goods. The colorful boats and busy crowds make it an unforgettable sight. This market is best for early risers, as it's only open from 6am until noon, but it's truly worth waking up early. Another market that's best for early risers is the Bang Khu Wiang floating market, which starts at 4am and closes at 7am. Monks arrive before sunrise, and before they begin to sell their produce they complete the tradition of receiving alms. This market definitely is meant to be more quiet and traditional, but if that's what you'd enjoy then it is well worth a visit. Getting there from Bangkok is also very easy - a boat ride to there would take about 45 minutes. Water taxis depart from Wat Chalo Pier every 15 minutes starting at 5 am. Out of all the floating markets of Bangkok, the Bang Khla market may possibly have the most breathtaking view. It's located along the Bang Pakong river, which means you'll have to take a taxi directly to the market, or take a bus from either the Mo Chit terminal or Ekkamai terminal. Not many tourists are willing to make a trip to this market, as it's located 100 kilometers east of Bangkok. However, it truly provides an authentic experience like no other, which makes it worth it. You can purchase delicious fish, shellfish, crab, and more. Local delicacies can also be found on the menus, and you'll surely find something appetizing. The Bang Khla floating market is only open during weekends, from 8am to 6pm. This market is conveniently located on the outskirts of Bangkok, approximately 20 kilometers from the center of the city. Although there aren't as many vendors selling out of their boats compared to other markets, there is a great market on land next to the water. Hardly any tourists visit the Khlong Lat Mayom market, which allows for an authentic market experience for those who do visit. There are many tempting food options available at this market, including soups, seafood, fruits, vegetables, and more. Clothing, plants, and flowers can also be found for sale at the market stalls. The Khlong Lat Mayom market is open on Saturdays, Sundays and on public holidays from 9:30am to 4:30pm. The Taling Chan Floating Market is definitely one of the larger floating markets near Bangkok. It isn't too popular among tourists, though, despite the fact that it's located in Thonburi, just a 25 minutes drive from Bangkok. The Taling Chan market is one of the larger floating markets, but it is full of flowers, plants, food and more for sale. There is a variety of fresh seafood, as well as traditional Thai dishes and snacks to purchase. Many visitors purchase bags of fish food to toss in the water surrounding the market, because of the catfish population. The Taling Chan floating market is only open Saturdays and Sundays from 7am until 4pm. 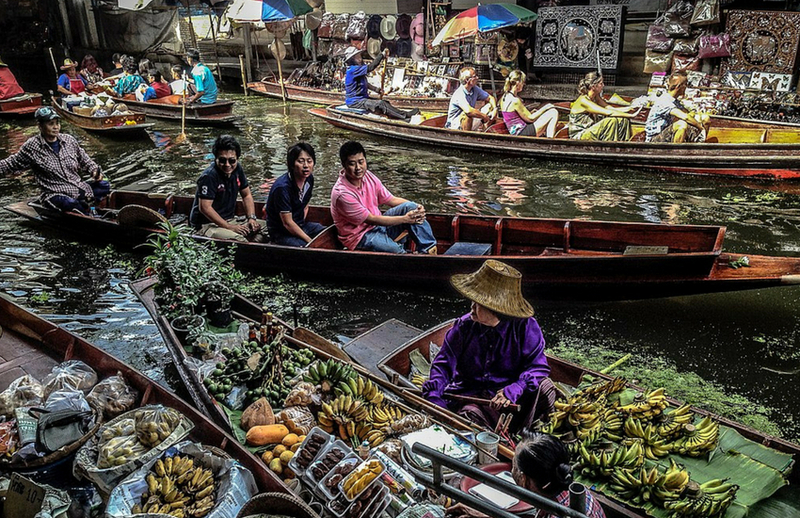 These are some of the most popular floating markets in the Bangkok area. Whether you prefer smaller markets that don't attract many tourists, or busy markets, these floating markets will not disappoint. Our concierges at our Thonglor Hotel and Soi 20 Hotel can provide directions, bookings and touring arrangements for you whilst exploring Bangkok.